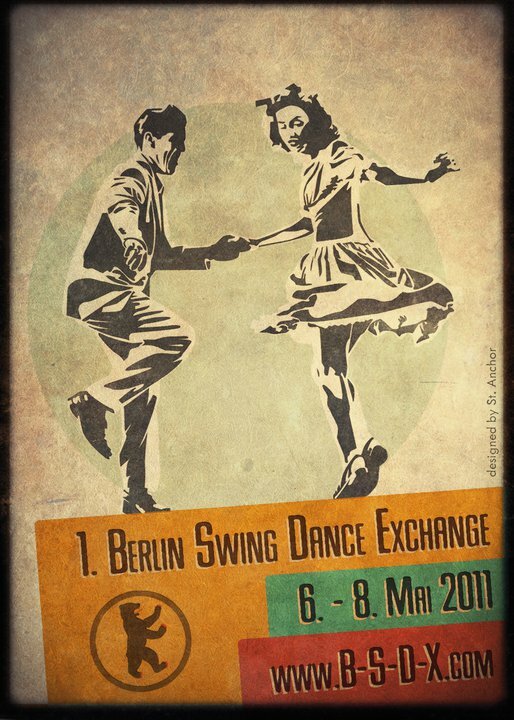 Berlin Swing Dance Exchange – BSDX 2011 | HopIt! UPDATE: Uhrgs, ich seh gerade die Party am Samstag alleine kostet 30EUR( Dreißig !!!)). Das find ich mal eindeutig zuviel. Das ist weder der Ort noch die Band Wert. Sorry. Welcome Party for the 1st Berlin Swing Dance Exchange! Dancing all night long in a new venue! Daytime for yourselves! Breakfast, sightseeing, just hang around and BERLIN! Around 6.30 pm SHIM SHAM Flashmob at Brandenburg Gate! This is a 14 piece Big Band from Berlin! They are amazing and they will play for us dancers!!! We have a really beautiful Ballroom as well! And Dancing again all night long! Just for Fun: Football Game and Outside Dancing around Mauerpark! Farewell Dance – Lindy Hop, Balboa, Collegiate Shag and Blues! Whatever you prefer! No Workshops! No Level! Just dancing and having fun!